The APP Ecosystem: How can blockchain disrupt the app store business? How can blockchain disrupt the app store business? Today when you want to buy content (e.g. books, songs, movies) there are hundreds of alternatives to choose from. But why, when it comes to apps, are there only two options (i.e. Google Play and Apple Store)? Taking advantage of blockchain technology, it is possible to disrupt the traditional app economy which is worth US$77 billion today. Here are some thoughts on how it can be done. Advertising: User acquisition is non-transparent and costly due to all the ad tech middlemen. By making use of smart contracts it is possible to establish direct relationships between developers and users, eliminating intermediaries. In-App Billing: A majority of the population still has no access to traditional payment methods. For those that do, and spend money inside apps, developers are frustrated with the cut taken by app stores. With blockchain it is possible to introduce a frictionless method to pay for in-game items and to pass on 85% of the value to the developer (vs. 70% today). App Approval: Android has a reputation of being unsafe when compared to other operating systems such as iOS. By developing a new reputation system based on the developer’s track record of transactions, which will be public in the blockchain, it is possible to develop a more transparent and secured environment. AppCoins will eliminate middlemen and create a new method to acquire users that will make CPI campaigns obsolete. We are calling it CPAt (Cost Per Attention) to allow a developer to directly reward a user for spending at least 2 minutes inside the app. 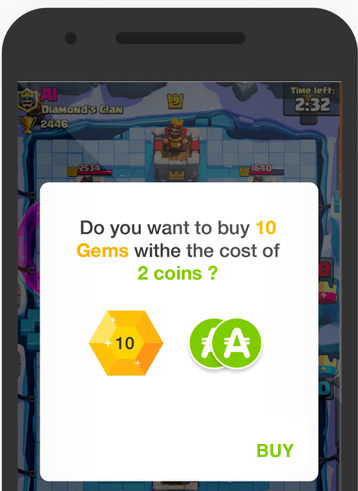 The users earn AppCoins, which are stored in their wallets, and can be used to buy in-game items (see In-App Purchases section below), closing the loop. By using smart contracts, we will guarantee that the user spends the required time and Aptoide will register all transactions in the blockchain to guarantee user authenticity. Consequently, fraud is avoided, which is responsible for over US$850 million in losses per year. Blockchain can help remove barriers for the unbanked. Today there are an estimated 2.6 billion smartphones in the world but 2 billion of those smartphone users do not have access to the payment methods required for in-app purchases such as a credit card. With the new model, users will be rewarded by CPAt campaigns (see Advertisement section above) and once they earn those AppCoins they can just turn around and spend them inside their favourite game or app hence closing the circular economy. It can also reward developers fairly. Whenever a user makes a purchase inside a game or an app, the developer only gets 70% of the transaction value. AppCoins will change that by rewarding the developer with 85% of the tokens spent by the user. How did we come up with that revenue split? Because we work closely with 12,000 developers, who told us that this would be the sweet spot of what they feel to be fair. The existing app approval process today is complex, being handled by centralized app stores with complex quality assurance flows and non-transparent distribution policies. 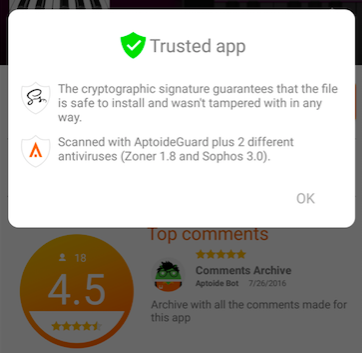 Similar to other competitors, Aptoide has been banned from Google Play for many years now, and has filed complaints with EU regulators. By using blockchain, app approvals will be made universal and more transparent through a developer reputation system. The reputation is tied to the financial transactions on the public ledger and is auditable. A dispute system will be created so that AppCoins’ owners can create rankings for developers and the apps they publish. 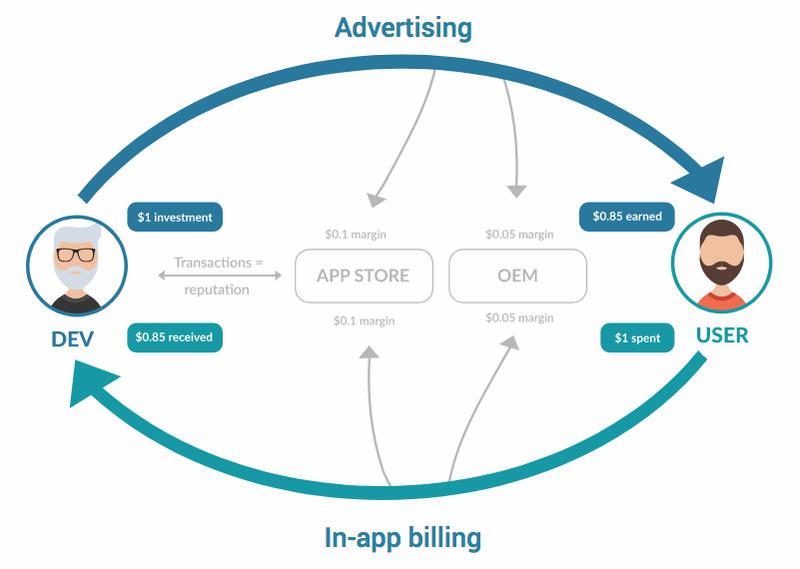 If you take a look at the circular diagram at the beginning of the article, you will notice that 5% of the value of all the transactions within the new AppCoins-based store will go to device manufacturers (OEMs) versus the 0% they receive from Google Play. This is unheard of, but from working with more than 70 OEMs around the world, we concluded that they are important stakeholders in the new app economy and should be rewarded accordingly. What we are proposing is a gigantic task. If it were easy, everyone would do it. We will share more revenue with developers, manufacturers will benefit from the app economy for the first time, and users will be rewarded through our novel implementation of the proof-of-attention concept. Thus, all stakeholders in the app economy (besides Google and Apple) will substantially benefit from Aptoide and its AppCoins integration.